You've connected your desktop PC or laptop with an HDMI cable to your TV, but there's NO sound coming out of your TV speakers while playing a movie or video. This tutorial will show you step by step how to solve this sound problem in Windows Vista, 7, 8, 8.1 and 10. Your problem has probably something to do with a sound setting in Microsoft Windows. 1. 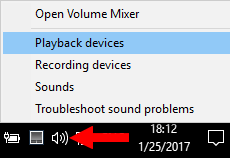 Right-click on the speaker icon located in the Windows notification area (system tray) and choose Playback devices. 2. Right-click on HDMI, Digital Audio, High Definition Audio Device or your TV and choose Set as Default Device. 3. Click on OK to save the setting and to close the settings window. 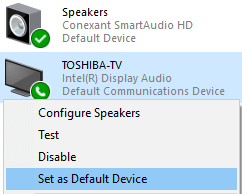 If you want to use your computer's speakers again, then right-click on Speakers and choose Set as Default Device.